Wine gets better with age. Software doesn’t. Probably the most overlooked factor for PC bugs and vulnerabilities is out-of-date programs. In an anonymous global study across over 100 million of our users, our new Software Updater built into AVG PC TuneUp found that 52% of the most commonly used programs aren’t being kept up-to-date. These are your Chromes, your Skypes, your WinRARs: the programs we use and rely upon everyday. Our full PC Report 2017 looks at all statistics and findings from this global study in more detail, but for now, we’ll just focus on the highlights of our research on outdated programs. Over half of the most common PC apps are out of date. Despite the millions of PC programs out there, the average user only has 49 programs installed. And many of them aren’t really programs, but tools and technologies like Visual Studio Redistributable, Flash or Java, which are required for some websites and other installed programs to actually work. At any rate, a huge chunk of these applications aren’t running the latest version. This may not seem like a big deal, but it’s the source of problems that range from merely annoying to downright risky. Incompatibilities: If you upgrade to the latest version of Windows or move to a new PC, there’s no guarantee that your old software will continue to run fine. On the other hand, the latest versions of your programs might have been optimized to run with the latest hardware, or have been retooled to work better with older hardware as well. Bugs & Crashes: No product is perfect on release. With so many different variations in PC hardware and user configurations, bugs and errors are inevitable. But software developers usually work hard to fix those flaws with later updates. Whatever frustrations you might be experiencing with a program may already have been solved with an update you’ve ignored. Vulnerabilities: Updates form the core of any serious online security: they provide ongoing fixes for any vulnerabilities that are found in programs. With tens of millions of users worldwide and poor update records, it’s no wonder hackers have programs like Flash or Java in their scope. Java alone has hundreds of potentially severe exploits. The blue screen of death is a common symptom of out of date apps. It would be easy to lay the blame on out of date apps on the laziness of most users. Checking each program for updates takes the word chore to a whole new level. But developers should know this better than anyone. The most out of date applications usually have easy-to-ignore updaters, don’t even check for updates at all, or just plain don’t get updates. On the other end of the spectrum are applications that automatically update themselves in the background or very effectively nag you whenever there’s an update. Even a 90% update rate still means millions of users could be left vulnerable. Our data from over 100 million users shows Apple’s Safari holds the No. 1 spot, with 90% of users worldwide running the latest release, closely followed by Google Chrome, which is being kept up-to-date on 88% of our sample. However, when that sample is 100 million strong, we’re still talking millions of people running older versions. Since Chrome and Safari have built-in updaters it’s likely that users have either turned off these updates, keep ignoring them or work in a business environment in which their admins prevent updates. Setting aside the benefits on compatibility and new features, the security fixes alone are important enough that you shouldn’t ignore updates. Whenever you see a prompt for an application update, just do it as soon as you can. 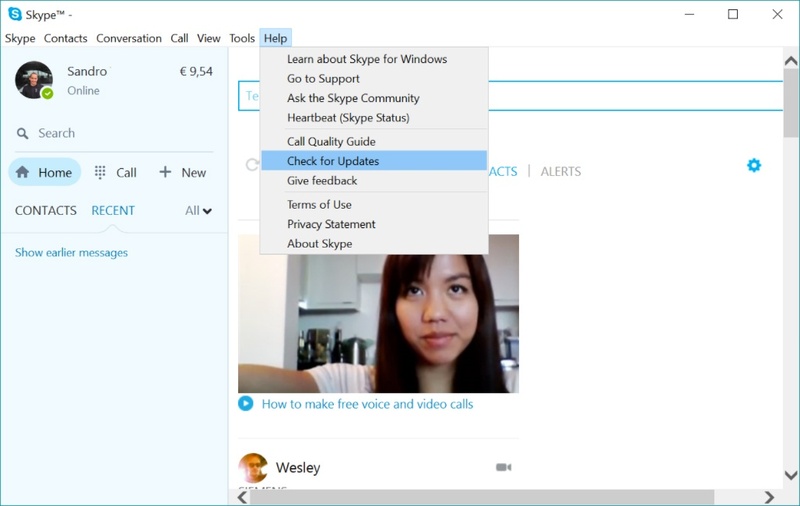 Checking for updates in Skype. 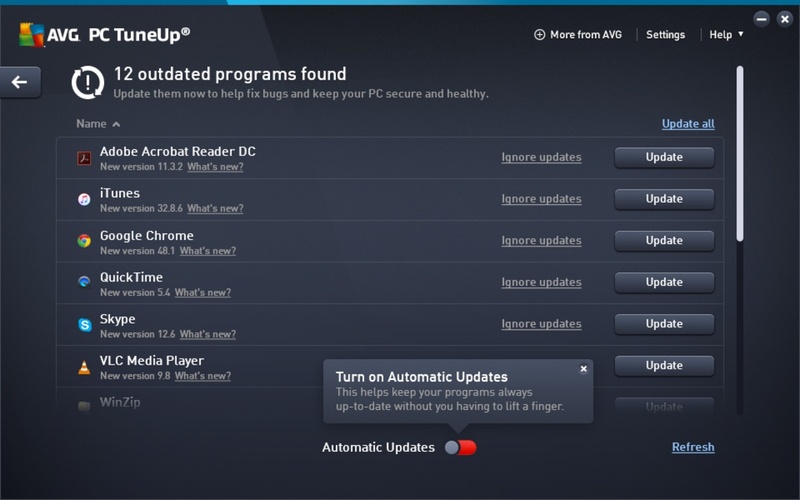 Doing this on a regular basis is annoying, which is why we built our new software updater right into AVG PC TuneUp. It supports almost 50 of the most used applications (and growing) and regularly checks & updates these applications silently in the background. If you’re more hands-on, you can also manually check the updates to see what’s new in each application. If you already have it installed, you should be getting the update soon. If you don't have it yet, you can try AVG PC TuneUp free for 30 days now.